Welcome to our new district website! By now you have noticed that our new website has a very different look and feel from our old website. We hope that you find it very user friendly and easy to navigate, it just takes a minute to get used to the new format. That's what this guide is for. When you enter in our new website address: www.mahometseymour.org you will be taken to our district site. You can navigate to each school using the "Schools" section in the top right hand corner. You will find that link on each school's page and you can link back to different schools using this feature. When you are at the school's page you want to visit, you will notice three sections at the bottom of the homepage. These sections are meant for you to get a quick glance at three rotating and relevant aspects of each school: News, Events, and Live Feed. The News section is designed for more in-depth information about a specific accomplishment or event that buildings want to highlight. The Events section will list upcoming events relevant and specific to each building or the district. The Live Feed is a new feature. This section will be linked to multiple Twitter and Facebook accounts for each building and the district; and will be a living stream of happenings in short and sweet tweets and posts. We know the kids will love this one. To get in-depth information regarding each building, you should click on the "Menu" section in the top left corner of each building's page. When you click on this hamburger, a new window will pop up over that school's homepage. Here you will find big bright buttons and links below to sections of the website, where we expect heavy use. You will see clear and easy access to menus, staff directories and athletics, just to name a few. You will also see sections for parents, students and staff. Feel free to click around and see where you need to go for your family's and children's needs. We know that the popular sections will be: lunch menus, classroom websites, Skyward, our online store and documents. 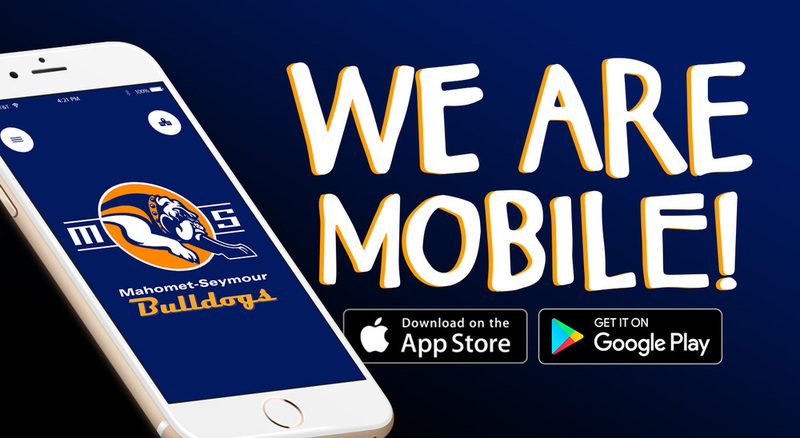 For the new app (available to download from the App Store or Google Play, search: Mahomet Seymour), you just need to remember two things: swipe left and swipe right. You will access each school, just like the website, from the top right. When you are in the school you wish to be in, swipe left to access the information you need. Once you are in that section, you just swipe right to get to that same section in a different school, or swipe left again to access a new section. You can now access lunch menus, Skyward and our online store from your phone. This is huge! Happy swiping. We hope that you will really enjoy using our new website and app. We feel that the buttons and links are now helpful and easy to access. We know that you will be as impressed as we are by its unique and exciting capabilities. Go get 'em bulldogs!